Dogs Poop in Alignment with Earth's Magnetic Field - Miata Turbo Forum - Boost cars, acquire cats. Dogs can typically smell and hear far better than their human companions. Now it appears they can sense Earth’s magnetic field too, say a team of biologists – and they show it when they poop. 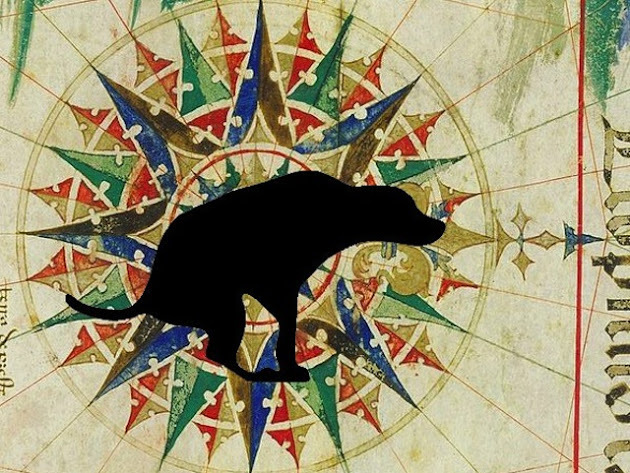 These canine compasses prefer to align themselves along a north-south magnetic axis when they relieve themselves, according to a study in the journal Frontiers in Zoology. The findings may help scientists better understand how that strange sense called magnetoreception manifests in mammals. Dogs wouldn't be the only animals thought to use magnetoreception: Birds do it, bees do it – and certain types of mammals do it, according to study coauthor Sabine Begall, a biologist at the University of Duisburg-Essen in Germany. The scientists studied 70 dogs of 37 different breeds as they defecated (1,893 dumps, to be precise) and urinated (a whopping 5,582 times) – data collected over two years. The researchers found that dogs prefer to point along the north-south axis when they do their business – as long as the magnetic field is stable. When the magnetic field shifts – say, because of an oncoming solar storm – it becomes more difficult to see the pattern, Begall said. Both male and female dogs took this north-south stance when defecating, the study authors said. But male dogs took slightly different positions when urinating – probably a result of their leg-lifting behavior. How that leg-lifting – right or left? – affects a dog’s alignment is “currently under study,” the authors wrote. The authors caution that more research is needed — in part because ‘normal’ magnetic conditions occurred only in 30% of the cases studied for this work. If they do indeed sense magnetic fields, why do dogs feel the need to point north-south when they do their business? The authors don’t know yet, Begall said. ^^^I chuckled for a bit on that note. Last edited by hornetball; 01-15-2014 at 11:56 AM. You make sure that dogs are correctly oriented before they poop? I was just quoting an epic Steve Martin line. But I'm old, and you youngsters probably have no idea what I was talking about. Epic fail. OTOH, I have a dog that learned to poop on our concrete patio because it didn't like ice/snow. It subsequently learned that pooping on concrete returns the excrement to what it considers an "edible" state more quickly. This dog is currently on a diet (vet's orders). The diet restrictions are an utter failure and the dog's breath is horrible. ^^^^That's so true, every time I try to give that dog a wet one I have to hold my breathe for fear of losing consciousness. I was just quoting an epic Steve Martin line. Sorry, I can't brain today. I have the dumb.